The 130cm 4 blade ceiling sweep fan with light offers a sleek and modern design fitting for almost any home decor. 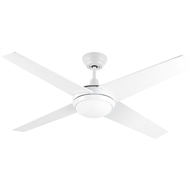 Allowing you decrease your heating and cooling costs, this ceiling fan delivers a powerful functionality with a 240V 70W motor keeping any room cool during the summer months. Not only providing a cool air flow through your house, this fan features a built in oyster light creating a soft ambience, while complimenting the fan's modern profile perfectly for a unique focal point in any room. Built with long life ball race bearings, the Arlec ceiling sweep fan provides superior long lasting performance for a cool change this summer.